This month construction has commenced on beamline tunnel extensions for Fermilab’s two muon experiments, Mu2e and Muon g-2. A team of physicists from all over the world, including postdocal researchers and graduate and undergraduate students, are working together to design, test, and build the Mu2e experiment. 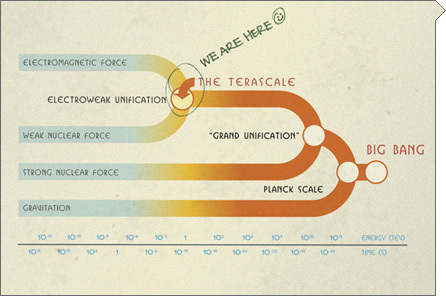 The Mu2e Collaboration is comprised of over one hundred physicists and continues to grow. The Mu2e detector is a particle physics detector embedded in a series of superconducting magnets. The magnets are designed to create a low-energy muon beam that can be stopped in a thin aluminum stopping target. The magnets also provide a constant magnetic field in the detector region that allows the momentum of the conversion electrons to be accurately determined. These superconducting magnets are big. The first, to the left, is about 12 feet long at 4.5 Tesla; the middle, S-shaped section about 40 feet along the curve at about 2 Tesla, and the third about 30 ft long and almost six feet across at 1 Tesla. The Earth’s field, for comparison, is 0.0006 Tesla. Muon g-2 (pronounced gee minus two) will use Fermilab’s powerful accelerators to explore the interactions of short-lived particles known as muons with a strong magnetic field in “empty” space. Scientists know that even in a vacuum, space is never empty. Instead, it is filled with an invisible sea of virtual particles that—in accordance with the laws of quantum physics—pop in and out of existence for incredibly short moments of time. Scientists can test the presence and nature of these virtual particles with particle beams traveling in a magnetic field. In the area of the current Delivery Ring (the former Antiproton Debuncher), southwest of the Booster, the existing beam tunnel will be extended approximately 200 feet, at which point it will branch in two separate directions. 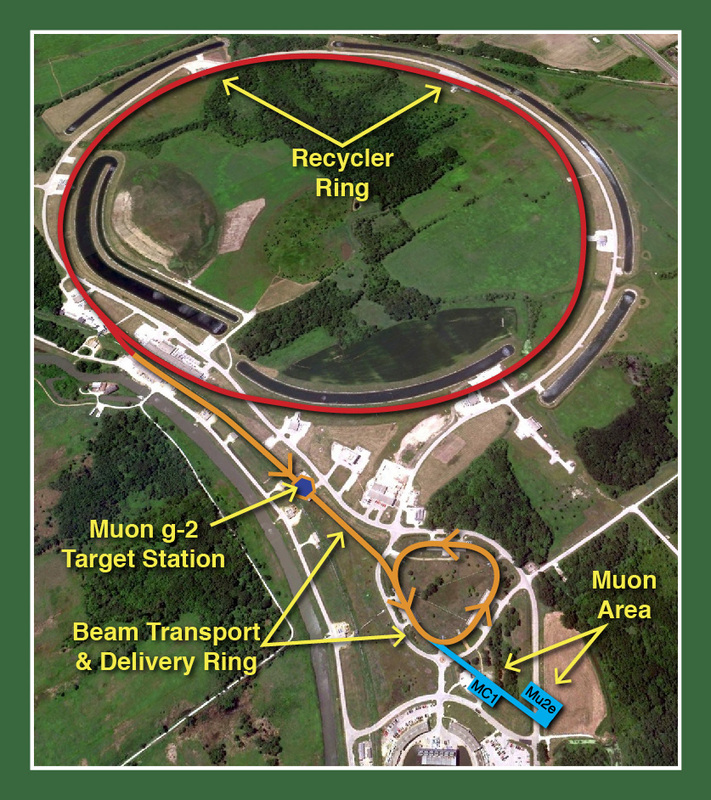 The Muon g-2 tunnel, about 75 feet long, will terminate in the MC-1 Building, which houses the experiment’s muon storage ring. The Mu2e tunnel, around 550 feet long, will head toward a new building to be constructed for the experiment. Construction is expected to take one year. The start of the construction of the Mu2e building is planned for 2015. Digging for the tunnels began this month. Part of Kautz Road will become permanently inaccessible, with a detour from South Booster Road and Indian Creek Road serving as the new road. Fermilab Accelerator Division physicist Mary Convery, who oversees the Muon Campus program, coordinated the tunnel designs with Tom Lackowski, project manager; Rod Jedziniak, project design coordinator; and Tim Trout, project construction coordinator, all of FESS. The primary challenge in constructing the beamlines will be in accommodating fixed features and structures, both man-made and natural. 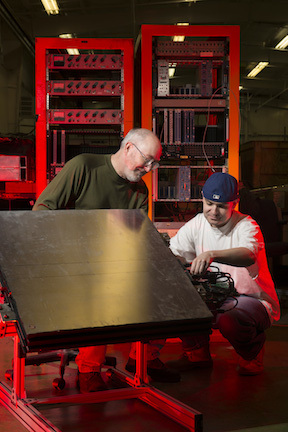 Convery said that these physical constraints were important considerations in designing the experiments’ beamlines, since the space available to accomplish the necessary beam manipulations was limited. Because the two muon experiments use the same beamlines at different energies, they cannot be run simultaneously. 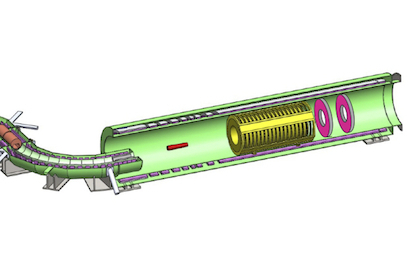 For both experiments, protons will proceed through the Linac, course through the Booster and then travel through the Recycler. A set of beamlines connects the Recycler to the Muon Campus. For the Muon g-2 experiment, the proton beam hits a target, converting the beam to a mixture of pions, protons and muons. The particles circle the Muon Delivery Ring several times, where protons are then removed and the remaining pions decay into muons. When the Muon g-2 experiment is taking data, the muon beam will continue to the experiment in the MC-1 Building. 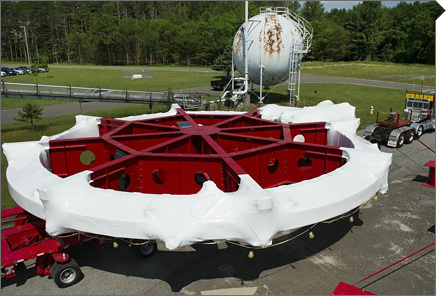 In contrast, for the Mu2e experiment, the protons bypass the target station and are transported to the Delivery Ring. The Mu2e protons also circle the Delivery Ring, then continue as an all-proton beam to the target in the Mu2e building area. Convery says work is also being done on other technical upgrades, such as installing magnets, along the beamline route. She expects the Muon g-2 experiment to begin in 2017, with Mu2e starting later, as scheduled.